Pisa is known for its leaning tower, but there is so much more to the city. 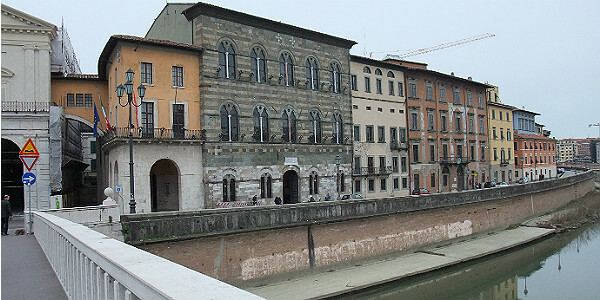 It was the home of Galileo and, at one time, one of the most important maritime cities in Italy. Today the city has a particularly young population, due to its three universities. During my visit, I stayed at The Royal Victoria Hotel, which is ideally situated on the road facing the River Arno and within easy walking distance of everything. Immediately behind the hotel is an area with local food shops and stalls of fresh vegetables. And in the late afternoon the many bars and restaurants that surround it come alive. It is a vibrant place to visit. If you happen to visit the city on one of the days when there is a walking tour, it is definitely worth spending the €12 to join one. Ours started in the Piazza Garibaldi, the city’s main square, which leads into the main chic street of the town with its covered walkways lined with boutiques. On the way we passed Salza, considered one of the best coffee shops in town. We later returned to sample their delicious, if expensive, cakes and chocolates. Our tour led to the Piazza dei Cavalieri, the site of the Governing Palace during the Middle Ages. 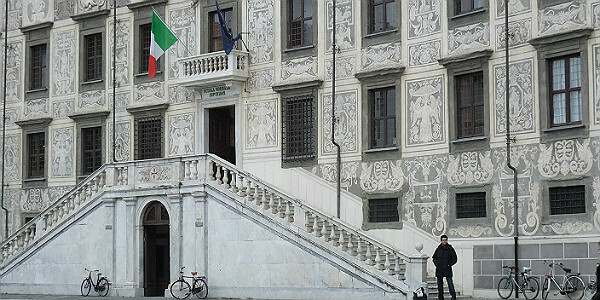 The building, with its impressive grey- and white-stencilled façade, now houses one of the city’s three universities. A short distance farther on are the city walls in front of which is the Square of Miracles with its famous leaning tower. Climbing to the top is a must, even though the 294 steps can leave you breathless. The amazing 360-degree view – not just of rooftops, but also the mountains and sea in the distance – is definitely worth it. However there is a lot more to visit than just the white marbled tower. Everything in this area was built between the eleventh and twelfth centuries and many of the buildings lean; although perhaps not quite as noticeably as the famous tower. This is because the city is built on marshes. Behind the cathedral, the graveyard is enclosed with huge walls on which are painted large allegorical frescoes. It is worth having a guide with you just to explain them. The city was bombed during the Second World War, and the roof of this area was destroyed. The frescoes, which in some places were badly damaged, are being restored to their original vibrant colors. I was recommended the Osteria di Culegna, a small restaurant specializing in local Tuscan cooking. As with most destinations in this compact city, it was a short walk from our hotel. If, like me, you enjoy looking in the shops, then don’t miss the opposite side of the river. Although the river edge is lined with what were once palaces, behind them is the main pedestrian shopping street. How To Get There: Even though Pisa has it’s own international airport (PSA), there aren’t many options for flights from the U.S. The best option is to fly to Florence Airport (FLR), and using it as a base for traveling to other parts of Italy. Florence is serviced by 16 domestic and international airlines, including Air France, Cityjet and SWISS. 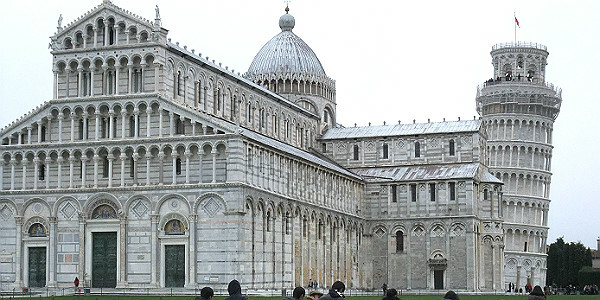 Pisa can be seen within a day or two, and you can easily take a train between Florence and Pisa, since it’s just a little over 60 miles between the two cities. The train ride between these two cities will take anywhere between 50 and 80 minutes. More information about the train and to purchase tickets, visit Trenitalia’s website.